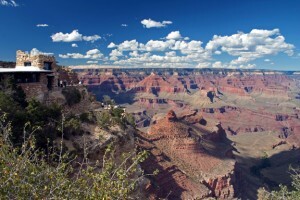 Grand Canyon South Rim Hotels, Lodging, Restaurants and Shopping. The Historic District at the South Rim began to take shape as stage coaches loaded with passengers began arriving to view the Grand Canyon. The arrival of the Grand Canyon Railway in 1901 provided a comfortable and affordable alternative to the stage coach, and quickly became the preferred mode of travel to the South Rim. The stagecoach companies were not happy with this development, but the guests arrived rested and ready to explore the newly famous gorge. The Historic District evolved and grew as tourism increased, and remains the center of activity at the South Rim today. There are many buildings of historical significance that visitors will find interesting during their visit to the South Rim. The canyon views from this area are stunning and offer a different perspective from those at Mather Point. The first major structure to be built in the Village was El Tovar, designed by Charles Whittlesey and financed by the Santa Fe Railroad. The hotel opened in 1905, and was one of the fanciest hotels west of the Mississippi. 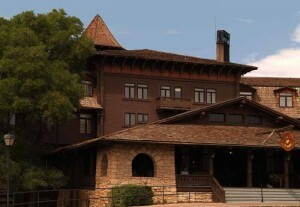 The Fred Harvey Company was chosen to manage the new hotel, due to an existing relationship with the Santa Fe. The clean, comfortable hotel with fine dining and activities was an immediate hit, and its popularity was fueled by the Sante Fe’s marketing efforts to publicize the beauty of the Grand Canyon. The hotel features 78 guest rooms, a gift shop, newsstand, dining room, and lounge. The hotel is open to the public and is a great place to relax and step back into life in 1905. 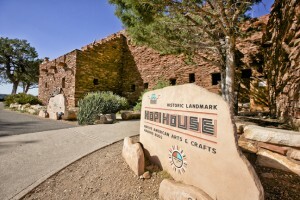 The Hopi House was designed by renowned architect Mary E.J. Colter and opened in 1905, at the same time El Tovar opened. Mary Colter was one of the first American architects to appreciate the natural beauty of Native American design. Therefore she designed Hopi House to reflect that of a typical adobe pueblo used by the Hopi Indians of Old Oraibi. The Hopi House, a National Historic Landmark, has been offering authentic Native American arts and crafts to visitors for purchase since the Fred Harvey Company opened its doors in 1905, over 100 years ago. A visit to Hopi House combines retail shopping with museum quality artifact viewing. Here you will find a large selection of native arts and crafts available for purchase, such as hand-crafted kachinas, Native American jewelry, hand-woven Navajo rugs and authentic Native American pottery. The second-floor gallery, which reopened to the public in 1995, offers a variety of museum-quality items. Hopi House is located next to the EL Tovar on the Canyon rim. It is open year-round. Hours vary seasonally. 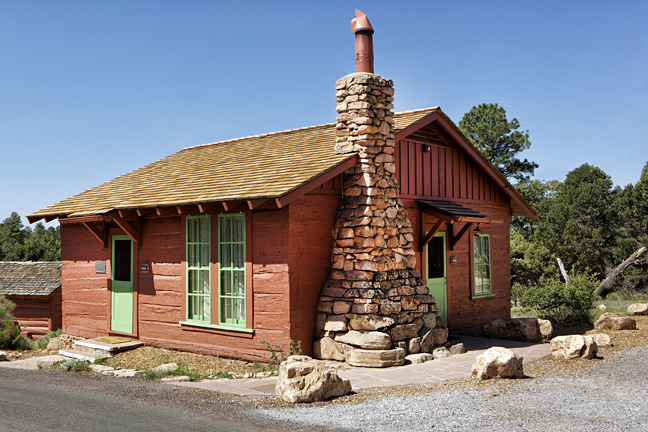 Lookout Studio was designed in 1914 by Mary Colter as a gift shop and lookout point for the Fred Harvey Company. 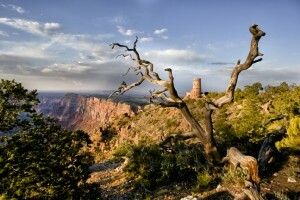 It is perched on the very edge of the rim, providing spectacular views. It blends exceptionally well with its natural setting. There are two small outdoor over-looks that are open in good weather. Lookout Studio sells photography and books related to the Grand Canyon, rock and fossil specimens (none collected inside the park), traditional souvenirs, books and photographic prints. It is located a short walk west of historic Bright Angel Lodge. Open year-round. Hours vary seasonally. As visitation increased at the South Rim, the Fred Harvey Company proposed a re-worked Bright Angel Lodge, to serve as a quality but lower cost option to El Tovar. Mary Colter designed the new facility, which offers a variety of accommodations. She even converted two existing buildings into guest accommodations: Buckey O’Neill’s cabin and the Red Horse Cabin. Buckey O’Neill was a local entrepreneur who built a cabin on the canyon rim in the late 1800s. Buckey was killed with Teddy Roosevelt’s Rough Riders in Cuba, and the National Park Service gave the cabin to the Fred Harvey Company to be used as a guest room. The cabin is the oldest continuously standing structure at the South Rim. The Red Horse Cabin was the Cameron Hotel, and was moved to its current location. It served as the Post Office but was abandoned. The Red Horse cabin is the oldest surviving structure at the South Rim. Both building are now guest suites and offer a glimpse into the past for those lucky enough to reserve them. 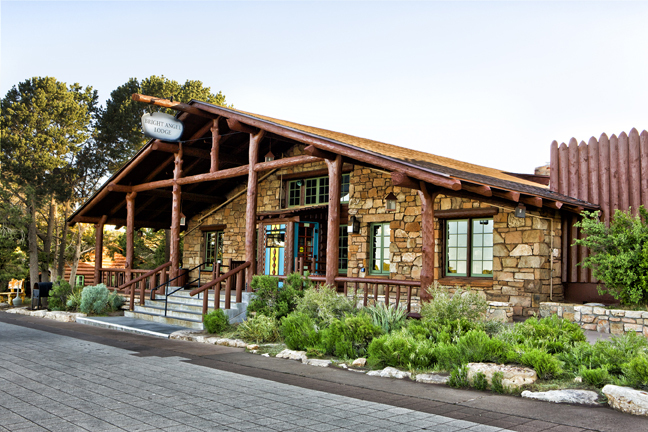 The Bright Angel Lodge became the hub of activity as soon as it opened, and remains the focal point of the South Rim today. The lodge features the Fred Harvey History Room, a free exhibit detailing the history of Fred Harvey Company and its famous Harvey Girls. 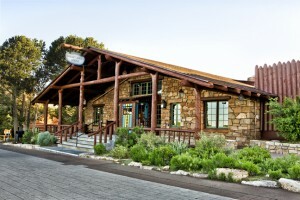 The lodge also features a gift shop, two restaurants, and lounge and an ice cream fountain. Once the home of the Kolb brothers, who were early photographers at Grand Canyon, the Kolb Studio features changing art exhibits displayed in the auditorium throughout the year. 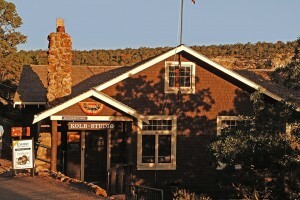 Built by Brothers Ellsworth and Emery Kolb from 1904 to 1926, Kolb Studio is included in the National Register of Historic Places and operated by Grand Canyon Association. The bookstore and auditorium are open to the public. The studio is located in the Village Historic District, at the Bright Angel trailhead. Open year-round. Hours vary seasonally. Two of Mary Colter’s most fascinating buildings are located away from the Village. These structures were designed as outposts and areas to provide visitors with different views of the canyon, and another opportunity to purchase a Grand Canyon memento. This is a National Historic Landmark is yet another extraordinary examples of Grand Canyon architecture designed by Mary E.J. Colter. 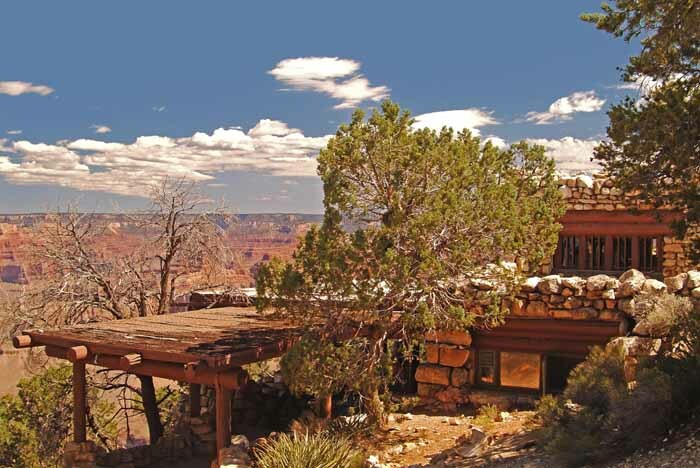 Constructed in 1914 for the convenience and comfort of the traveler at Grand Canyon, Hermits Rest offers a far-reaching and interesting view of the canyon. The main structure contains a snack bar and gift shop featuring traditional gifts, park souvenirs and Native American handicrafts. Hermits Rest is located at the western end of the Hermit Road, approximately nine miles west of Grand Canyon Village. This area is accessed only by shuttle from March 1st through November 30th. 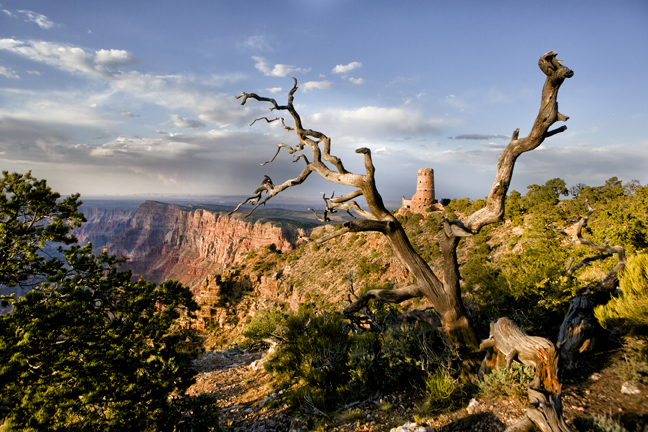 You can access the West Rim Road and Hermits Rest by hiking, bicycling or in-park tour bus on a year round basis. Modeled after ancient ancestral Puebloan watchtowers found in the Four Corners region, the Watchtower is a unique example of Mary Colter’s design style. Built in 1932, this seventy-foot tower is the highest point on the South Rim and offers stunning 360-degree views of the Painted Desert, the San Francisco Peaks, the Vermilion Cliffs, and beyond. You can climb the stairs all the way to enjoy these spectacular views. The walls of the tower feature murals by Hopi artist Frank Kabotie. The gift shop sells local Native American handicrafts, including jewelry, rugs and pottery. The Watchtower is located at the eastern end of the Grand Canyon South Rim, approximately 26 miles from Grand Canyon Village. Open year-round. Hours vary seasonally. The El Tovar Stables (1904) were built to house horses and mules used for transportation around the park in pre-automobile times, and continue to be used to house mules for the Bright Angel Trail to the Phantom Ranch. Individually listed on the NRHP. Verkamp’s Curio Store (1906), is now Verkamp’s Visitor Center, operated by the Grand Canyon Association for the National Park Service. Built by Ohioan John George Verkamp, who sold Native American crafts and souvenirs, the two-story shingled building has been described as “modified Mission” style, resembling an adobe building in form but not materials. The Grand Canyon Depot (1910) and Grand Canyon Railway (1905) were built by the AT&SF. The depot, designed by Francis W Wilson, is an individually listed National Historical Landmark, and the railway is on the National Register of Historic Places. Colter Hall- Designed by Mary Colter and located behind El Tovar, it was a dormitory for the Harvey Girls. It serves as a female dormitory today.